Hot cross buns come from the wheat cakes that were baked in honor of Eostre. As part of the adoption of traditions, Christians added the cross on the top and had the cakes blessed by the Church. In England, it was believed that hanging a hot cross bun in the house would protect it from fire and bring good luck for the coming year. Besides the Easter holiday, today also marks the final day of the Challah bread series we’ve been doing this week. You guys finally get to find out what I did with the three loaves of braided Traditional Challah and the Vanilla Bean Challah that I made (y’know, besides just eat it warm and slathered with butter). This time, instead of finding another way of doing Challah, I wanted to use it as a main ingredient in another dish. I went with a recipe that my twin sister has been asking me to make for a while now that she saw on the Food Network. I love this recipe for so many reasons- not least of which is how awesome it tastes, which I’ll get to in a minute. What I really liked about it was that it let find a use for the ‘end’ pieces of the challah loaves. Don’t look at me like that. I know I’m not the only one that usually ends up throwing them out. Let’s face it: no one really wants them-until now that is. At first I was concerned that only 9 slices of bread wouldn’t be enough to make a substantial casserole. I was also worried that they would be overly soaked and ultimately soggy from the egg custard. Fortunately, I was surprised. The bread puffed up really well when baked. Challah’s a pretty sturdy bread, so it was more than able to stand up to the egg mixture. I will say this though: if you’re using plain old Texas Toast bread, then I would think about bumping it up maybe two or three slices, as it’s much softer than Challah. It also doesn’t taste near as good, but you guys knew that already, right? Okay, now to the good part: what does it taste like? 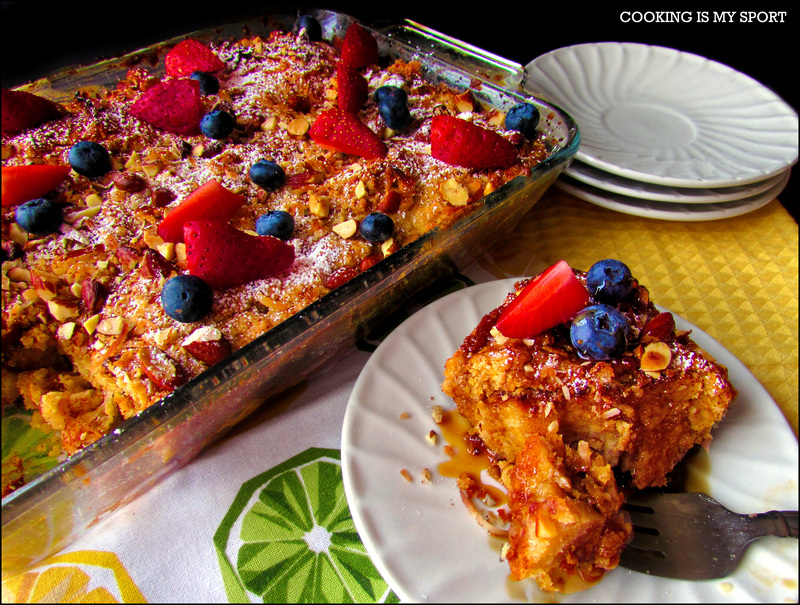 Well first of all, what really (and I mean REALLY) sets this dish apart from any normal overnight French Toast Bake is the Coconut Almond Crust that’s baked on top of it. It’s like a crunchy, sugary almost candied carmelized effect that is doubly awesome when contrasted with the soft texture of the baked challah. If you’re not entirely convinced, then let me say up front that I’m not even a fan of coconut at all. I don’t care for the texture or overall flavor…and I STILL couldn’t imagine eating this dish without the coconut almond crust. It’s that good. As you can see, I sprinkled powdered sugar on top of mine and added some berries and syrup, but my mom and sister said that they thought it was good enough to eat all on its own. If you’re looking for an easy dish to make for breakfast or brunch guests that will still knock their socks off, this is the one to try. Or maybe you’re like me and baked a crap load of Challah or other sturdy bread that you have to do something with to avoid letting it spoil. Make this. You won’t regret it. And I guess that does it for the Challah Series. Until I find another one to try. Then it’ll probably get a reboot. Don’t put it past me. 1. Preheat the oven to 300°. Lightly butter a 9-by-13-inch casserole dish. 2. For the French toast: Lay the bread slices in one layer (it’s OK if they overlap a little) on a baking sheet. Bake the slices (to dry them out a little) for 6 minutes, then flip and bake for 6 minutes more. Set aside to cool. 3. Whisk together the eggs, half-and-half, granulated sugar, vanilla, cinnamon and salt in a large bowl. Dunk each bread slice in the egg mixture to coat thoroughly and shingle the slices in the buttered casserole dish. Pour any remaining egg mixture over the bread. Cover the dish with plastic wrap and refrigerate for at least 6 hours or overnight. 4. 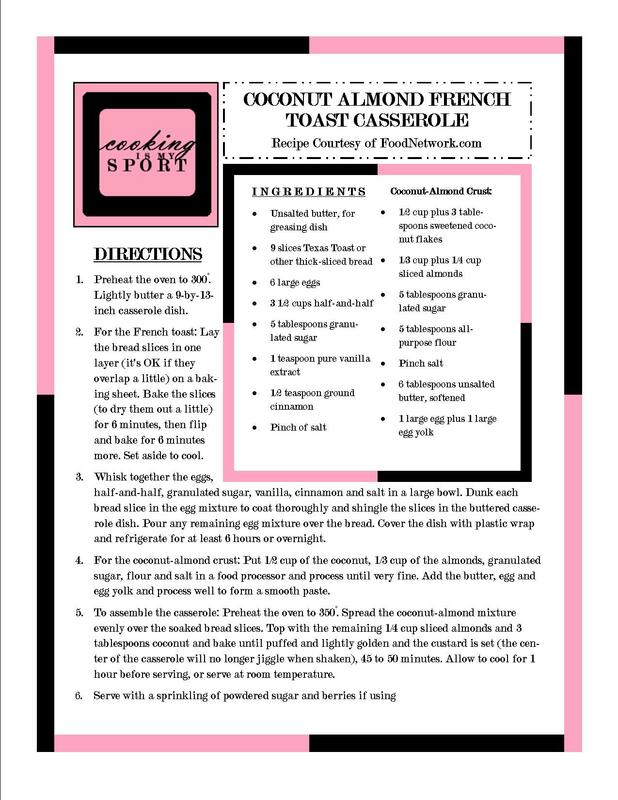 For the coconut-almond crust: Put 1/2 cup of the coconut, 1/3 cup of the almonds, granulated sugar, flour and salt in a food processor and process until very fine. Add the butter, egg and egg yolk and process well to form a smooth paste. 5. To assemble the casserole: Preheat the oven to 350°. Spread the coconut-almond mixture evenly over the soaked bread slices. Top with the remaining 1/4 cup sliced almonds and 3 tablespoons coconut and bake until puffed and lightly golden and the custard is set (the center of the casserole will no longer jiggle when shaken), 45 to 50 minutes. 6. Allow to cool for 1 hour before serving, or serve at room temperature. 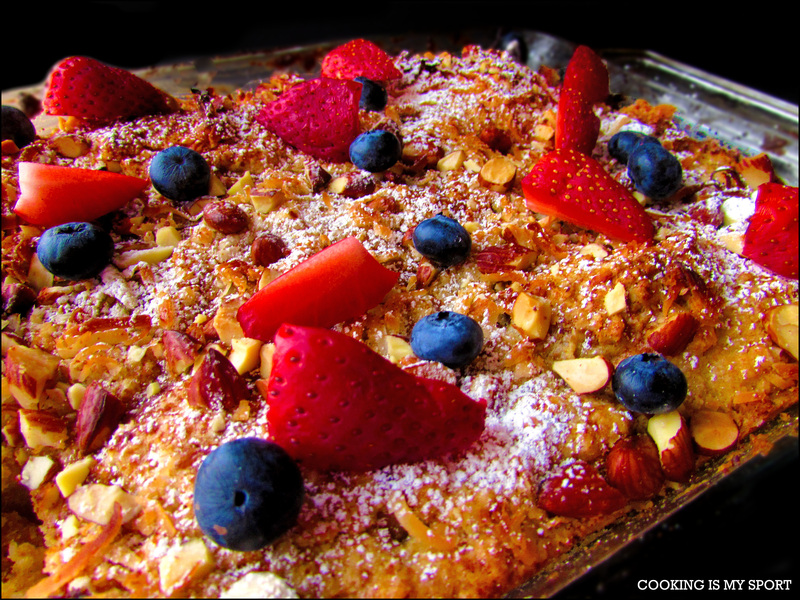 Serve with a sprinkling of powdered sugar and berries if using. Ahh hah…french toast it is! 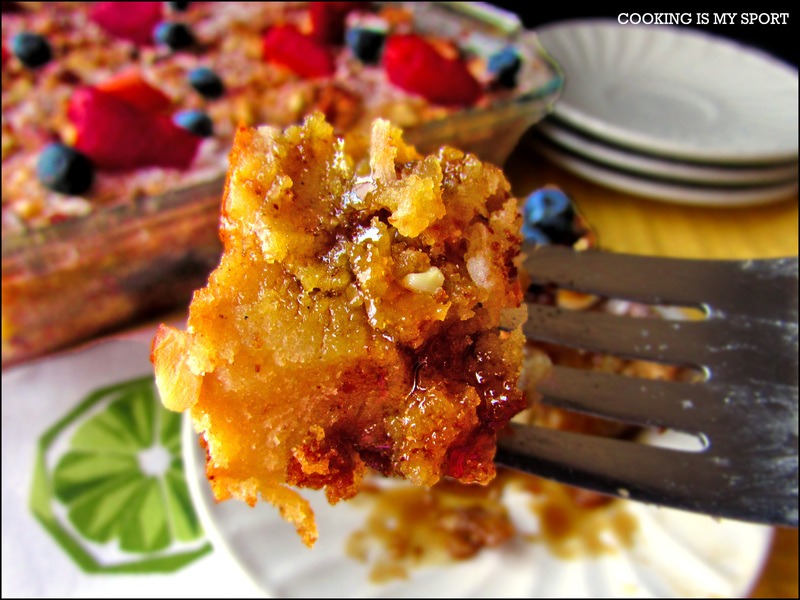 And in a casserole form…looks delicious Jess! Looks great! 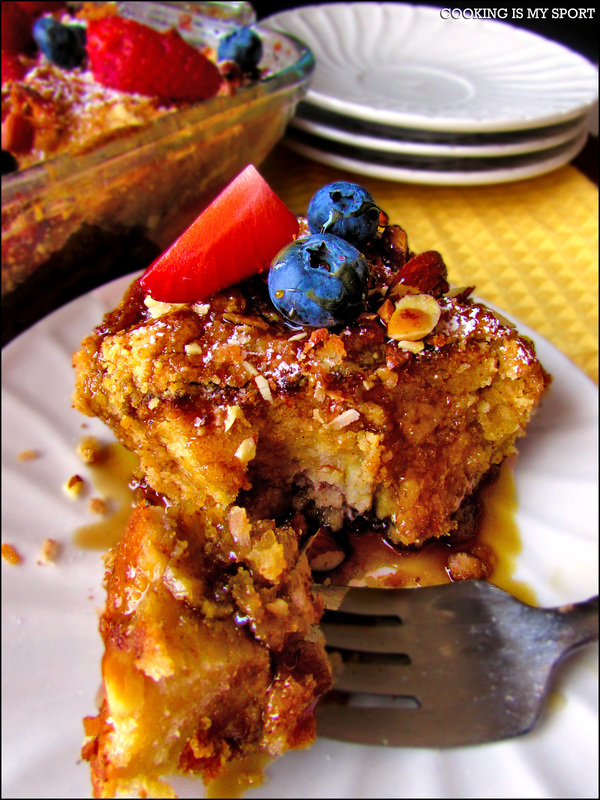 Challah makes a wonderful French toast and I love coconut and almond together. Looks like a winner! Ooh, love the coconut in this! What a fresh twist. This looks fabulous, Jess! Hello Mother’s day brunch. This looks fantastic, the berries make me feel like its summer! Hi Jessica. 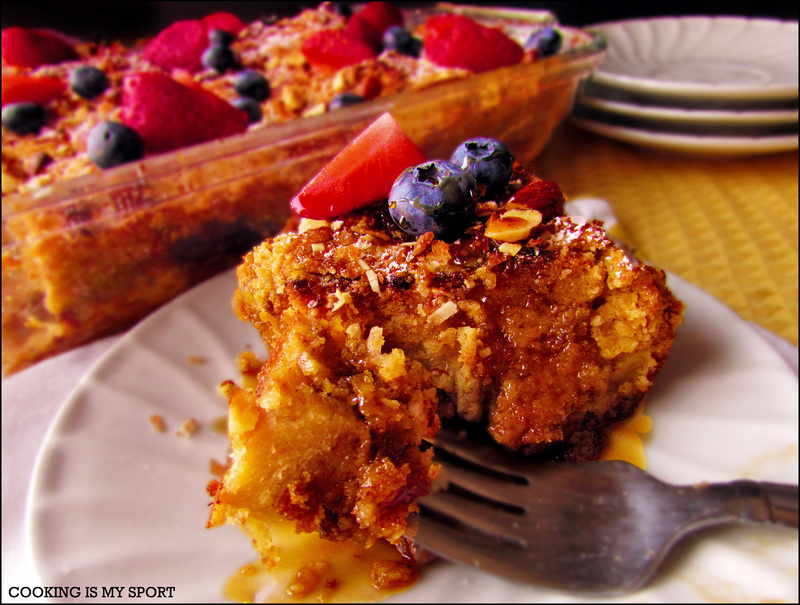 This French toast casserole looks heavenly. I think I may have added a few pounds just looking at your pics. And thanks for sharing the trivia about Easter.